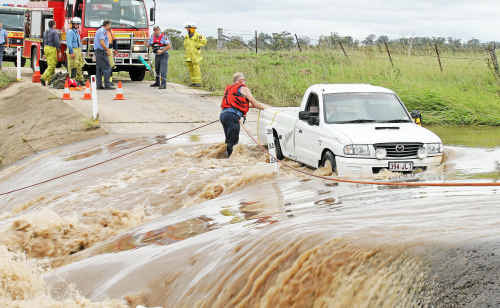 Emergency crews work to free a woman trapped in her ute on an overflowing river crossing on Kirklands Road yesterday. THE partner of a Warwick woman who spent a harrowing hour trapped in a flooded creek yesterday morning has issued a heartfelt thank you to emergency crews who pulled her to safety. Fire and rescue, police and ambulance officers were called to a causeway on Kirklands Road at Willowvale about 9.30am where they were confronted with a Mazda utility partially submerged in a roaring Glengallan Creek. They worked furiously to drag the vehicle out of the floodwaters with the driver, aged in her 50s, emerging shaken but otherwise unharmed. Her partner, who asked that the couple not be identified, told the Daily News she had been out taking photos of a property they were considering purchasing. “She was happily enjoying a drive through the lush green countryside when she was caught off-guard by a blind causeway,” her partner said. “Our vehicle ended up being submerged in the creek and she found herself in a really difficult situation. He said he was unable to find the dirt track off Willowvale Road but expressed his gratitude to the emergency crews. “They gave all assistance with ease and professionalism and we both wish to thank them for everything they did. “My partner was uninjured apart from being very shaken by the experience. The utility was in about 400mm of water, but rushing with incredible force after the huge rains of the previous 48 hours. The woman appeared calm during her ordeal, swishing away flies while her rescuers worked to attach cables to her vehicle, which for one horrifying moment shifted slightly but then stabilised. Wading into the water himself was Warwick Command Inspector Hemmo de Vries, who is one of two specially-trained “swift-water” rescue technicians. He attached himself to a nearby fence post with rope and quickly reached the trapped vehicle, reassuring the driver and securing a cable to the towbar, while fellow officers winched the ute to safety. The driver emerged remarkably steady on her feet and was briefly examined by ambulance officers before being transported home by police. Inspector de Vries said she was “very, very happy to be back on terra firma”. 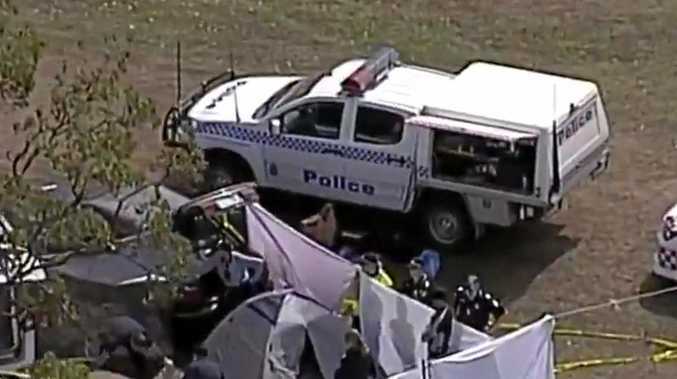 “She was sitting in a foot of water and was telling me she and her partner were planning to take the ute on a trip in a couple of weeks – she was downloading a lot of stuff,” he said. “She was smart enough not to get out of the vehicle. “We just want to reiterate to people the dangers of floodwaters and plead with them not to cross them under any circumstances.